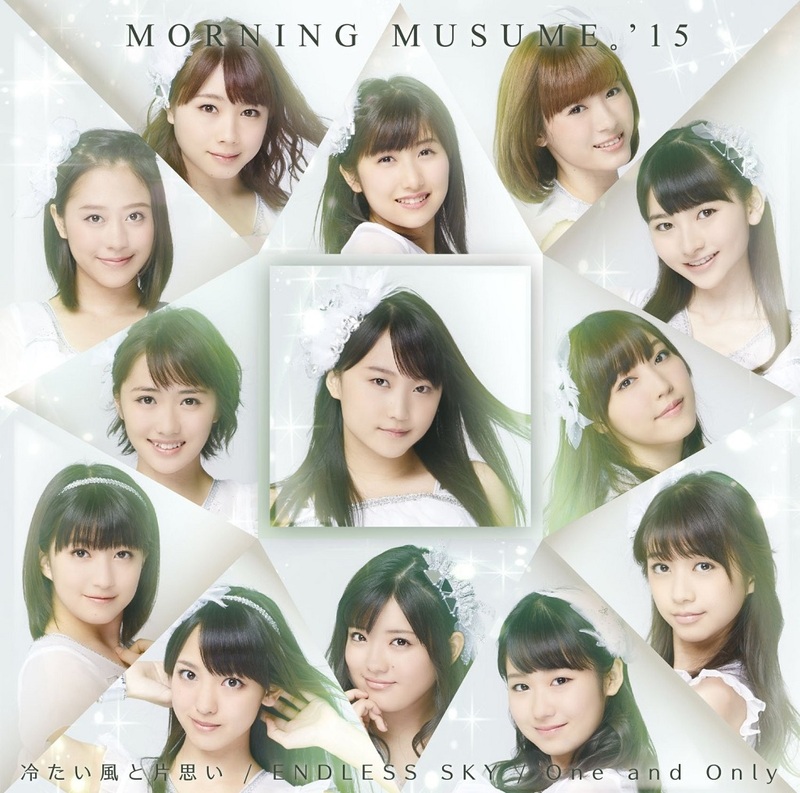 Long overdue, here is the review for Morning Musume’s 60th single titled Tsumetai Kaze to Kataomoi / ENDLESS SKY / One and Only. The last single to feature 9th generation member Sayashi Riho before her graduation shortly after the release. Released on December 29, this single is certainly a milestone for the group. Solidly making way for the group, Sayashi Riho was among the most popular members and the face of the group for years after her addition to the group. Her sudden graduation was a surprise to many. Likewise, the recent announcement that Suzuki Kanon would also be leaving the group by Spring was a blow for many, especially me since she has been among my top members of the group. We aren’t sure if this will be her last single, but it is among the last for her. Despite that, this single is a reflection of the group’s ability to take on any genre with a smile. From the English-only track One and Only, to a more sorrowful and passionate sound in Tsumetai Kaze to Kataomoi this single is packed full of surprises for anyone to enjoy. Is this single one of Momusu’s highlights or is it just another single we brush aside? Let’s find out! Covers are the face of the single. Having a visual impact and catching the eye of those in the store is important and Hello! Project did an amazing job with them. Those of us who have followed the group for a while know that we tend to get not only one theme per release. That would be too simple! Instead we get various styles, each showing off a side of the group in a new light. Most recently we have seen H!P go for a more unique theme for every A, B, and C edition, reflecting every song included with the release. There’s nothing regular about the covers since we get a showcase of styles that set the tone for each song. 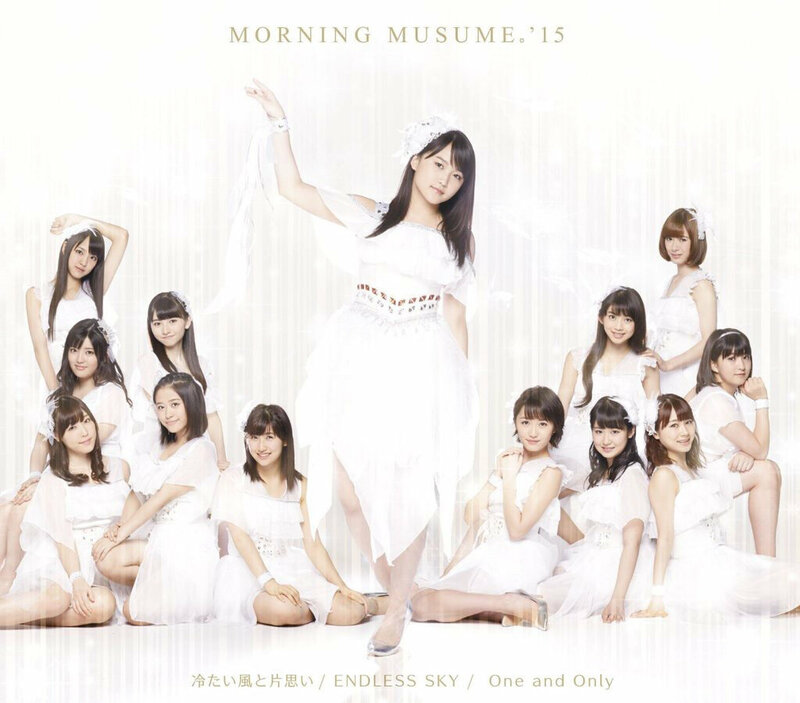 Version A showcases Tsumetai Kaze to Kataomoi, with Riho proudly standing in front of the members in a white dress with a golden light shining upon them. It’s similar to a preview release from the group, Shouganai Yume Oibito, but the style is too timeless and befitting to argue against it. Version B shows off a more interesting theme with the members laid out on each side of a purple stripe. Nice and definitely a cool look but in a way it looks like a headache since you might be a fan of the members at the bottom and would have to lay the single upside down to see them well. Version C is the odd one out, with a happy style to it similar to Kare to Issho ni Omise ga Shitai! which is a nice touch. It’s been a while since we’ve seen them go for a happy sound so it definitely makes me think of the days where they used to dress up as baby chicken idols. Limited editions are the fan favorites, usually featuring a DVD for everyone to enjoy at home with an exclusive MV or Making Of. They showcase a similar style to the Regular versions, but in a somewhat more exclusive way. They do reflect the looks of their Regular sides well, with Limited A having a diamond look to it but with the golden glow. Definitely a nice batch with the Limited C having a creative design, and Limited B having a Renai Revolution vibe to it. I wasn’t disappointed at all by the covers, so these get a solid thumbs up from me! Hello! Project tends to have a more safe style when it comes to singles so we don’t get many additional tracks as a result. This release is no exception with only the three a-sides and their instrumentals on all of the versions, not really giving any other bonuses for getting one version over another. Being an H!P fan I am used to it, but hopefully they add some exclusive tracks with later releases since it is somewhat weak to rely on only covers to differentiate each version. In a way this is Riho’s main track, with the song being called Cold Wind and Lonely Love. This song focuses on Riho mostly showcasing her dancing skills as the R&B track slowly plays in the background with the vocals being the main feature. The black dress and the white dress transition as Riho busts her moves is a delight, and the song definitely showcases a more mature group that shows how good they are at adapting to the sound. With a mature tone to the electronic song, I am a big fan and would definitely listen to it multiple times on calm days. I was definitely getting a Shouganai Yume Oibito vibe due to the dresses. It’s not a bad thing but it’s hard to go for a ballad sound without thinking of that single. One thing I would have loved to see is the members having a dance duel with Riho or at least a duet but this being her last single it made sense for them to focus on her. 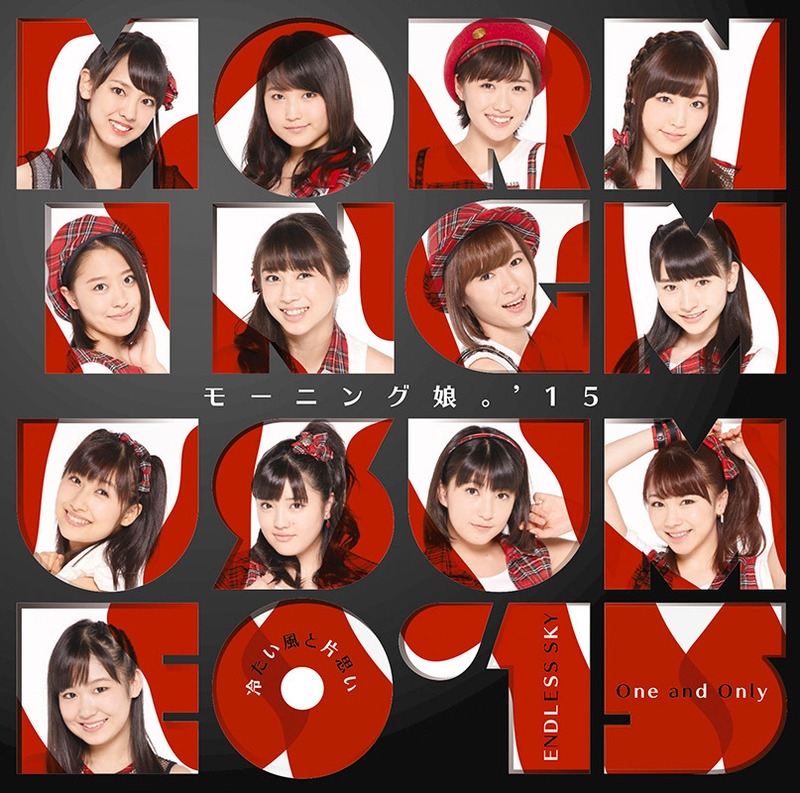 Well balanced song for fans of the more mature Momusu. Despite the English title and the overuse of white fabric, this song is not as upbeat as I had imagined. It has a similar sound to the previous song but with a slightly younger style that is sure to have fans happy with a sound of hope to it. The setting is a bit more calm with the bulk of the MV featuring the members laying down in a circle as well as a dance shot of them dancing and concentrating hard on the white fabric on the walls. Slightly typical idol theme, but the song definitely feels like it fits this style. Not a big fan of the song but the electronic backing does hold it up well, especially with all of the members getting a chance to sing and showcase their voice well. English-only songs are a difficult world for Japanese idols since most don’t speak English at a level that many would consider fluent. That’s not a problem at all but of course some fall flat when it comes to that. Thankfully Momusu did an amazing job with the song, showcasing an international look that is sure to help them gain footing as they expand over the border of Japan. This song was the theme song for J-MELO so naturally it got a good promotion, and I’m loving the sound of it since it reminds me of 3,2,1 BREAKIN OUT. As they make their way to Houston in a matter of weeks this is definitely a nice way to promote it and the sound is sure to have fans around the world rocking out together. With an idol sound and a rock touch in the instrumental the vocals match well. The setting reflects that with the world playing behind them as well as them dancing in the clouds with the lyrics flowing behind them. Sure, there are times when the instrumental is a bit awkward but in a way it fits in well so it’s well worth a look for those who are looking for a more upbeat Momusu. Nice props to the electronic bridge that has a nice glitch sound to it since it showcases their new style a bit more. This is a solid single from Momusu! The variety of sounds from the mature ballad, to a more hopeful ballad, as well as the rock heavy English track are a testament to how amazing the group is. Well balanced and providing just a touch of their trademark style, they have left me with a smile once again. As for this being Riho’s last single, she was without a doubt among the most talented members in terms of voice and skill. Despite that fans have always commented on one thing: she never seemed comfortable. She seemed like more of a solo artist, and in a way we could see that was certainly true. Now with the recent news that Suzuki Kanon will also be leaving it’s definitely a sign that we are in for some big changes. Her cheerful attitude is a testament to how despite not being in the forefront of the group she was always happy to sing for everyone and make all of us smile. Will Morning Musume change? Of course, but being part of the Hello! Project fan base since I was young (going on almost 7 years now) has shown me that the group adapts. Young talent rises as part of the group and modifies the style, image, and sound to match the times. Slower ballads dominated the birth of Morning Musume. Slowly progressing to a happier, upbeat sound as the years went on. With the addition of the 8th generation came the period of more mature songs. Nai Chau Kamo. Resonant Blue. Nanchatte Renai. Now, we’re in the more EDM focused era of Momusu where they have shown that while the group might have a long history they still have what it takes to be among the best of Japan’s idol scene. I’m looking forward to seeing what they have to offer as the years come by. Each new generation adds a new spice to the group, and while lineups will change, my passion for Morning Musume and their amazing music will never change. Thank you Sayashi Riho and Suzuki Kanon for your time with Momusu!